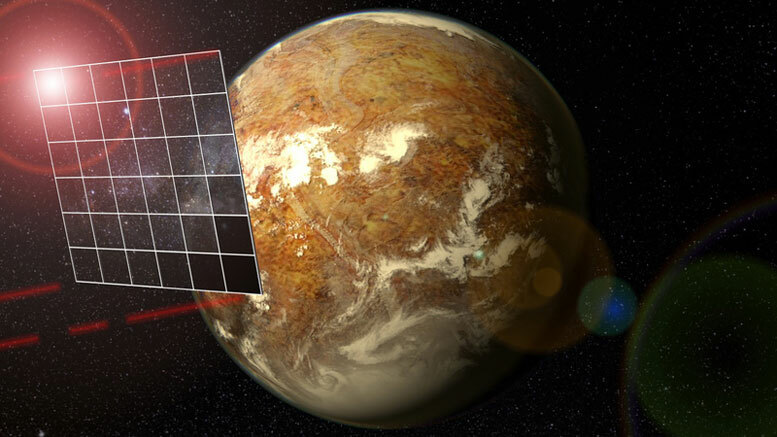 Interstellar journey: The aim of the Starshot project is to send a tiny spacecraft propelled by an enormous rectangular photon sail to the Alpha Centauri star system, where it would fly past the Earth-like planet Proxima Centauri b. The four red beams emitted from the corners of the sail depict laser pulses for communication with the Earth. New research details how to use the radiation and gravity of the stars to decelerate a high-velocity interstellar projectile. In April last year, billionaire Yuri Milner announced the Breakthrough Starshot Initiative. He plans to invest 100 million US dollars in the development of an ultra-light light sail that can be accelerated to 20 percent of the speed of light to reach the Alpha Centauri star system within 20 years. The problem of how to slow down this projectile once it reaches its target remains a challenge. René Heller of the Max Planck Institute for Solar System Research in Göttingen and his colleague Michael Hippke propose to use the radiation and gravity of the Alpha Centauri stars to decelerate the craft. It could then even be rerouted to the red dwarf star Proxima Centauri and its Earth-like planet Proxima b. In the recent science fiction film Passengers, a huge spaceship flies at half the speed of light on a 120-year-long journey toward the distant planet Homestead II, where its 5000 passengers are to set up a new home. This dream is impossible to realize at the current state of technology. “With today’s technology, even a small probe would have to travel nearly 100,000 years to reach its destination,” René Heller says. Notwithstanding the technical challenges, Heller and his colleague Michael Hippke wondered, “How could you optimize the scientific yield of this type of a mission?” Such a fast probe would cover the distance from the Earth to the Moon in just six seconds. It would therefore hurtle past the stars and planets of the Alpha Centauri system in a flash. The solution is for the probe’s sail to be redeployed upon arrival so that the spacecraft would be optimally decelerated by the incoming radiation from the stars in the Alpha Centauri system. René Heller, an astrophysicist working on preparations for the upcoming Exoplanet mission PLATO, found a congenial spirit in IT specialist Michael Hippke, who set up the computer simulations. The two scientists based their calculations on a space probe weighing less than 100 grams in total, which is mounted to a 100,000-square-metre sail, equivalent to the area of 14 soccer fields. During the approach to Alpha Centauri, the braking force would increase. The stronger the braking force, the more effectively the spacecraft’s speed can be reduced upon arrival. Vice versa, the same physics could be used to accelerate the sail at departure from the solar system, using the sun as a photon cannon. The tiny spacecraft would first need to approach the star Alpha Centauri A as close as around four million kilometres, corresponding to five stellar radii, at a maximum speed of 13,800 kilometres per second (4.6 per cent of the speed of light). At even higher speeds, the probe would simply overshoot the star. During its stellar encounter, the probe would not only be repelled by the stellar radiation, but it would also be attracted by the star’s gravitational field. This effect could be used to deflect it around the star. These swing-by-maneuvers have been performed numerous times by space probes in our solar system. “In our nominal mission scenario, the probe would take a little less than 100 years – or about twice as long as the Voyager probes have now been traveling. And these machines from the 1970s are still operational,” says Michael Hippke. Theoretically, the autonomous, active light sail proposed by Heller and Hippke could settle into a bound orbit around Alpha Centauri A and possibly explore its planets. However, the two scientists are thinking even bigger. Alpha Centauri is a triple star system. The two binary stars A and B revolve around their common center of mass in a relatively close orbit, while the third star, Proxima Centauri, is 0.22 light years away, more than 12,500 times the distance between the Sun and the Earth. The sail could be configured so that the stellar pressure from star A brakes and deflects the probe toward Alpha Centauri B, where it would arrive after just a few days. The sail would then be slowed again and catapulted towards Proxima Centauri, where it would arrive after another 46 years − about 140 years after its launch from Earth. Proxima Centauri caused a sensation in August 2016 when astronomers at the European Southern Observatory (ESO) discovered an exoplanet companion that is about as massive as the Earth and that orbits the star in its so-called habitable zone. This makes it theoretically possible for liquid water to exist on its surface – water being a key prerequisite for life on Earth. “This finding prompted us to think about the possibility of stopping a high-velocity interstellar lightsail at Proxima Centauri and its planet,” says René Heller. The Max Planck researcher and his colleague propose another change to the strategy for the Starshot project: instead of a huge energy-hungry laser, the Sun’s radiation could be used to accelerate a nanoprobe beyond the solar system. “It would have to approach the Sun to within about five solar radii to acquire the necessary momentum,” Heller says. This animation shows a photogravitational assist as calculated from numerical calculations of a modified N-body integrator including the photon pressure of the star alpha Centauri A on the light sail. At the end of this video, the sail is being reaccelerated by the stellar photon pressure. Combinations of this effect at the stars alpha Centauri A, B, and C (Proxima) could be used to shoot the sail back to Earth, if the spacial deflection is properly chosen. The two astronomers are now discussing their concept with the members of the Breakthrough Starshot Initiative, to whom they owe the inspiration for their study. “Our new mission concept could yield a high scientific return, but only the grandchildren of our grandchildren would receive it. Starshot, on the other hand, works on a timescale of decades and could be realized in one generation. So we might have identified a longterm, follow-up concept for Starshot,” Heller says. Although the new scenario is based on a mathematical study and computer simulations, the proposed hardware of the sail is already being developed in laboratories today: “The sail could be made of graphene, an extremely thin and light but mega-tough carbon film,” René Heller says. The film would have to be blanketed by a highly reflective cover to endure the harsh conditions of deep space and the heat near the destination star. The optical and electronic systems would have to be tiny. But if you were to remove all the unnecessary components from a modern smartphone, “only a few grams of functional technology would remain.” Moreover, the lightweight spacecraft would have to navigate independently and transmit its data to Earth by laser. To do so, it would need energy, which it could harness from the stellar radiation. 2 Comments on "Space Travel Visionaries Solve the Problem of Interstellar Slowdown"
I’m Wow’d by it, no bout a doubt it. I want to ask a questions about the recently resolved black hole. That was done in radiowaves, correct? What wavelengths? Is it correct too that the hole is rotating a radial? velocity of .5c? If so, then the rotating hole would have a pronounced oblate spheroid shape would it not with frame dragging at the equator? Frame dragging causes gravity waves, yes, and should be detectable by a space born Lagrange points as gravitational standing waves? Can a particle ‘surf’a gravitational wave?